Last night I attended a Kane County for Bernie meeting that was intended to wrap up our effort, and to develop a list of suggestions that might be useful to the national campaign as it moves on into other states. After Bernie’s not-so-crushing defeat in the primary the day before I expected to be met with a bunch of depressed and morose volunteers. Sure, many of us touched on our disappointment that Bernie had not won Illinois outright, but we were pleased that Bernie did win the areas we were working in, Kane and Kendall Counties with more than 57% of the vote, and Aurora (one of those urban areas where Bernie supposedly does not do well) with 52%. As I said, I had expected sorrow, but what happened at that meeting was not a wake but a wake-up. I sat there listening, with my legs still aching from canvassing and my mind kind of foggy with exhaustion as it had been all day, and I gradually started realizing that talk was turning from how the national campaign can tweak things going forward to how we can go forward. How can we organize Kane County progressives to run for local elections? 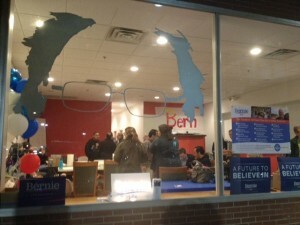 How can we continue to help the Bernie Sanders campaign, beyond making calls to other states? How can we stay in touch with each other and grow the movement? A lot of great questions, with some preliminary answers, including the formation of teams to hone messaging, to develop tech training for volunteers, and to research election laws in two adjacent states with upcoming primaries. And an agreement to meet back in the office on Tuesday at 7:00 p.m. to be trained in whatever those teams develop. Because at this point, it looks like we are going on to Wisconsin, followed by Indiana. At one point in the evening I offered up this blog as an online space where local progressives can post and follow local progressive news and races over the long term. The blog is not going anywhere and anyone is welcome to post, comment, read and stay aware. To Kane County’s Bernie team I extend a heartfelt Welcome! I came very late to the Kane County for Bernie effort and wish I had put in a tenth of the effort that so many of you in that room last night have given. You are the future of progressive causes and elections in Kane County, and you give me great hope for that future. You can respond to the event invite for Monday’sTuesday’s event here. You can donate to Bernie here.